At the National Ploughing Championship Dairymaster launched six versions of their high-performance Swiftflo Revolver cow rotary milking parlours due to market feedback and demand. As the market leader in rotary milking systems in Ireland and Britain, Dairymaster identified a need in the marketplace wanted to ensure that there is a Swiftflo Revolver parlour to suit every farm. Most dairy farmers only install one rotary in a lifetime so choosing the right system is of utmost importance. The Swiftflo Performance is suitable for entry level farms with little automation. These are aimed at the farmer who wants to get the right size rotary while allowing them to add automation features when their budget allows and dependent on what is right for their farm. The Swiftflo Optimum is suitable for typical family farms with some automation. 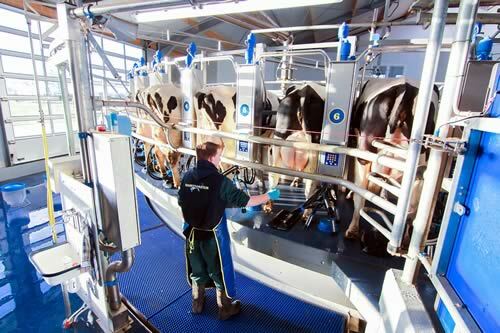 These incorporate some of the smart automation features that Dairymaster are renowned for including the Swiftflo Pulse, Retention, Milk Diversion and much more. The Swiftflo Endurance range is designed for people who want a fully automated solution and is aimed at large scale farms with full automation milking many cows. This system has the most advanced technologies including the Swiftflo Commander, Auto ID, Milk Manager, Voice Assist and much more. Each range has a plus option with an extra level of automation and additional features. The entire range of Dairymaster rotary parlours are built to last. For example, Tom & Simon Brown, Dairygold Coop milk suppliers at Greenhills dairy farm in East Cork installed a Dairymaster Swiftflo Revolver 18 years ago and it is currently milking over 1,000 cows a day. Included in all the range is their recent development Rotaglide which is like the suspension system in a car. It reduces maintenance, improves cow comfort and helps your rotary parlour last much longer. The Swiftflo Revolver is extremely cow friendly and safe due to its design with sensors at both the cow entry and exit. The unrivalled throughput you get from a Swiftflo Revolver is due to the consistent cow flow achievable with Dairymaster milking systems. Dairymaster rotaries milk more cows in less time with less labour, it’s a must-have for any forward-thinking dairy farmer interested in high performance milking and value for money. Dairymaster are recognised as one of the world’s most innovative companies in agriculture and this year they celebrate 50 years in business.